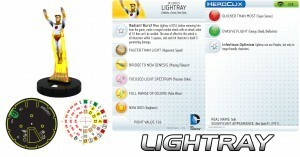 WizKids is previewing another new mini for the upcoming Superman set for Heroclix with a look at Lightray. And welcome back as we continue to explore the characters in the upcoming DC HeroClix: Superman and the Legion of Super Heroes set. Today we are off to New Genesis to check in with one of the residential New Gods, specifically, Lightray!